PHOENIX ‒ The Mohawk Rest Area has reopened on Interstate 8, giving drivers a new place to stop and rest, stretch their legs and exercise their pets on the drive across the desert between Yuma and Gila Bend. 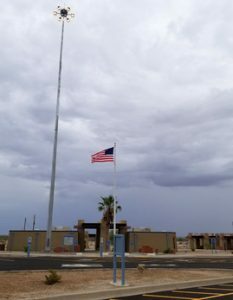 The Arizona Department of Transportation rest area, located near the Mohawk Pass at milepost 56, includes all new facilities, including new restrooms as well as new plumbing, electrical systems and parking areas. The $4.6 million project also included making the rest area compliant with the Americans with Disabilities Act, which is part of every rest area renovation. The rest area had been closed since 2009. ADOT has been making improvements to rest areas across the state in recent years to repair and replace infrastructure that has been in place for as long as 50 years. That includes drilling new wells to provide adequate water supplies and replacing septic systems that have reached their life expectancies. The renovations are designed to make Arizona’s rest areas more functional and pleasant. Once little more than bare-bones stopping spots on the freeway, today’s rest areas include drinking fountains and vending machines, pet exercise areas, restrooms and ramadas. Some, including Sunset Point on I-17, offer stunning mountain and desert views. And they’re clean: Caretakers are on-site at most rest areas 16 hours a day.